The system disambiguates words and processes meaning. Metalingua system breaks the language barriers in the Web. Madrid, April 24th 2009- InterLan, the Spanish technology firm dedicated to developing software systems, has launched officially the last version of Metalingua, its innovative technology, at the www2009 Conference. The Conference has been hosted by Tim Berners Lee (Web inventor), and Vinton Cerf (known as the ‘father’ of the Internet). 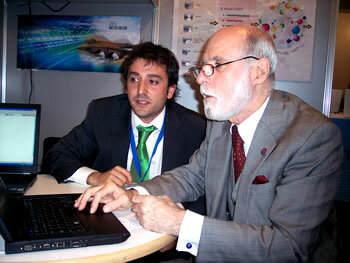 During the Conference, the system has been visited and put to test by experts such as Vinton Cerf (TCP/IP Designer, Google´s Vice President), Dale Dougherty (who coined the term Web 2.0), and Dame Wendy Hall (President of Association for Computing Machinery and Web Science co-founder), who valuated very positively this technology. Some other members of the Conference also became interested in learning more about the system, being among them Alfred Z. Spector (Google´s Research and Special Initiatives Vice President), and Richard Ishida (W3C). Language barriers prevent many users from sharing web opportunities in different fields: education, training, communication or economy. If a series of software facilities existed that allowed the speaker of a minority language to work on the Internet in that language, regardless of the source language of the documents or the content on which he is working, this user would find that the Internet allows him to work in his/her mother tongue to a greater extent than in the past, thus enabling him to actively use this language in the workplace and make it develop according to his/her needs. In that context, InterLan has launched Metalingua, which aims to facilitate multilingual communication and, in particular, to protect and develop the use of different languages. It is an engine that processes natural language in an intelligent way, via a knowledge representation system, thus enabling multilingual communication through the translation of any source text in one language to any other language, including natural and artificial languages (SQL, etc…). Thanks to Metalingua technology, Interlan has developed the first semantic and multilingual search system. In addition, its multilingual translator is able to break the language barriers. Instead of performing a literal translation, Metalingua works with concepts, which means that when a new language is entered, the user needs to define key words in the target language for each concept. The disambiguating process involves five analyses of each term: morphological, syntactic, semantic, pragmatic, and functional. Once the new language is inserted, this interconnects with all the other concepts in the system, together with any others entered at a future date in a Metalingua conceptual map. The languages currently operating 100% in the system are: Spanish, and English. German and French are implemented up to 60% by now, and their integration continues. At present, Interlan is collaborating in a machine translation project for the Information Service and Science News Platform (SINC). Semantic search: the engine searches for concepts instead of for words, the system processes meanings. It can be connected to any Content Management System or Internet Search Engine. Multilingual search: The user’s mother tongue can be used to search for concepts in documents that are in different languages. The system displays information in the user’s language and a copy of the original in the source language. It can be connected to any Content Management System or Web Search Engine. Multilingual machine translation: the meaning undergoes a disambiguation process, after the five levels of analysis mentioned above have been performed. Then, the meaning is represented in Metalingua, ready to be synthesized in target languages. The system accepts several types of document formats such as word, pdf, xml, html, power point, Excel. In addition, the system can create, use and store translation memories and customized dictionaries. HMI (Human Machine Interaction), Natural Language processing, SQL: The Metalingua system processes natural language and translates it from any non-human language or machine language such as SQL, SPARQL, etc. Semantic Annotation, Data Mining, RDF… After the language is processed, the system analyzes the content and provides a semantic annotation. Voice recognition and multilingual content management systems. The mission of the METALINGUA UNESCO Foundation is to make a concerted effort to protect linguistic diversity. Its main goal is to work towards the linguistic diversity of the Information Society. In pursuit of this goal, the Foundation works with Metalingua, donated by InterLan. The Foundation focuses on three lines of action: digital anthropology, technology and social communication. This enables the Foundation to study the customs of digital communities that speak minority languages, addressing a series of technological and infolinguistic engineering challenges while seeking a solution that serves to highly protect-increase the size of such minority communities. Furthermore, the Foundation plans to work in partnership with UNESCO to raise awareness towards minority languages, especially as regards Digital Societies, through different communication channels (conferences, publication of articles, and its own website). InterLan System is part of a group of companies set up over 30 years ago dedicated to developing software systems that aim to enhance business productivity. It is based in Erandio-Bilbao, Madrid, and Boston, and is the distributor of products based on Metalingua technology. InterLan offers a comprehensive portfolio of leading-edge solutions in information disambiguation that help clients break linguistic barriers on the Internet.